been a really great trip. Mom: Hey Ali, wanna go out for dinner and go with me to see a performance of Othello done by biker gangs? Me: I don’t understand how this is even a question. WHEN DO WE LEAVE? Mom: It might not be all that good, but it will be nice for you to get out of the house and have a child-free minute. Me: Are you kidding? I probably could not be more excited. 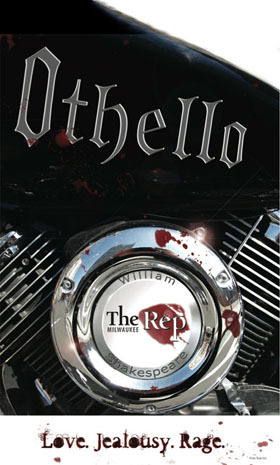 Shakespeare meets Sons of Anarchy meets West Side Story? BEST THING TO EVER HAPPEN TO THE LAND OF BEER AND CHEESE! Let the record show that I know more about Shakespeare than Harley Davidsons, and Othello is, by far, my favorite work of the old Bard of Avon. But, you know, I was the one person on earth who saw O in the theater and loved the heck out it. But, then again, 10 Things I Hate About You as Taming of the Shrew worked for me too. So, what I’m saying is that I kind of dig the loose interpretation thing. And, also, I dig when the dude playing Iago looks like a cross between Jon Krasinski and Andrew Garfield and knocks his many, manyÂ soliloquiesÂ out of the midwestern park. Impressed, I was. But perhaps I shouldn’t have allowed the kids the go with their Zaydie for an all-you-can-stuff-down-your-gullet movie + pizza + pop + candy + popcorn night. Because it never ends well. Ever. (O! now, for ever.Â Farewell the tranquil mind; farewell content! )Â Which should be super fun for our drive to Chicago and flight to Toronto today. But at least I didn’t have to see The Three Stooges. « GOD: What in MY NAME IS A STARBUCKS? Can’t say I’m not thrilled to be done with Passover food. I actually loved 10 things I hate about you. Have fun with your remaining time here in Milwaukee and next time you come, you should check out Leon’s Frozen Custard Stand. It’s a close second to Kopp’s. I think I am going to have to try Chocolate Chex when I jump south of the border in 2 weeks…and who could go across the border without a stop at Target. I’m sort of sad it’s finally coming to Canada because I really don’t think it will be the same. But…I will have a Target 15 minutes away, instead of almost 3 hours, so there’s that! The Mayor is so fired from babysitting.